A visit to a building that is not a building, that’s our suggestion for a stopover in Bordeaux. Confused? 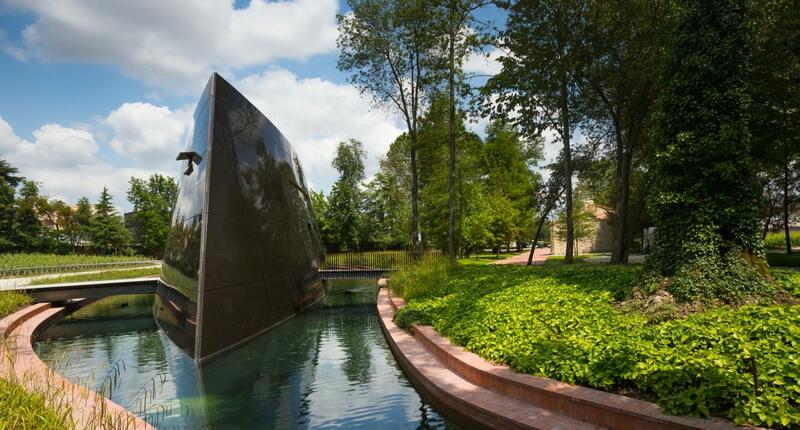 Well, that’s how Philippe Starck describes one of his latest creations, the new winery at Château Les Carmes Haut-Brion in Bordeaux. Patrick Pitcher, the owner, had expectations that were both very clear and very ambitious: "We wanted a one-off design, a cellar that was like no other." Patrick’s gamble ended up being generously rewarded with a truly stunning result: an enigmatic blade of exposed metal lodged in a small lake in the very heart of the domain. The raw purity of the lines continues inside the complex, which is all concrete, wood, glass, metal and special lighting. "We wanted to honour the mystery of wine, so we had to go for the minimalist effect." The winery and cellar are underground to protect the 300 barrels from the fluctuations in the temperature. On the upper floor, there is an area for receiving the harvested grapes. The tasting takes place in the adjoining building. Don’t leave without taking a detour to the terrace that towers over the estate. All in all, the “non-building” is a genuine masterpiece and the wine tasting exceptional — a combined experience that we thoroughly recommend. Le Bordeaux Gordon Ramsay: On the Place de la Comédie in Bordeaux, with breath-taking views of the Grand Théâtre. A historic brasserie with a warm and friendly atmosphere. Specialities from southwest France with a strong British influence, such as scotch egg with smoked salmon, fish and chips and sea bream. The à la carte menu and set meals are supervised by the English TV chief. Chambres d'hôtes at the Château Pape-Clément: In Pessac-Bordeaux, 15 minutes from the city centre and airport. Rooms and luxury guest suites in a 16th century château with a refined, chic atmosphere, woodwork from yesteryear and 19th century furniture. There is also a park surrounded by 60 hectares of vineyards. Tasting and gourmet cuisine on request.